Blue Morpho is among the largest butterflies with a wingspan of 5-6 inches. They mainly live in tropical forests of South and Central America. Blue Morpho is extremely popular because of its vivid blue colored wings with black edges. Male Morpho has brighter wings than females. The underpart of this unique creature appears in brown color with a various number of eyespots. When threatened by other animals this beautiful butterfly release a strong smell from their glands. This butterfly is very attractive and has low narrow wings with zebra-like stripes. Their black wings with yellow stripes make their look even more stunning. The fascinating butterflies are dispensed throughout South and Central America. Their beautiful wingspan ranges between 72 and 100 mm. This unique creature likes to feed on pollen. According to the scientist the nutrients they get from pollen helps them to live a long life. This unique creature is recognized by their striking eye-spots. The fascinating butterflies are mostly found in South Asian countries. Its upper side is yellowish brown in color with brown edges. Distinct coastal bars and attractive ‘peacock eye-spots’ are also present on its wings. The eye-spots which are present on the lower part of the wings become more prominent and beautiful. The leaves of the host plant are their main food. Peacock Pansy favorite place is gardens and open areas. Eighty-Eight Butterfly comes at number 7 in the list of most unique and beautiful butterflies. This unique creature is native to South and Central America. The numbering is the same in different 12 species but the coloring and pattern are slightly different. The upper side of its wings are black in color and band of blue and green also appears on their fore-wings. You will find these beautiful butterflies sometimes in small groups and sometimes in large groups. The interesting thing about them is that they are often found in human habitations. They prefer to rest on rock faces and mineral-rich soil. This fascinating and unique creature is well-known for their eyespots which actually resembles owl’s eyes. These eyespots are present on the underpart of the wings. This owl butterfly family member is native to South and Central America. They are also among large butterflies and have a wingspan between 13 and 16 centimeters. Their huge eye pattern also helps them against their potential predators like lizards or frogs. Through these eyespots, they also scare other small animals. The upper wings of this Giant Owl Butterfly are yellowish brown in color with purple borders. This pretty butterfly is distributed across Peru, Ecuador, and Bolivia. The transparent inner part of its wings lined by black outer wings. Their attractive and elegant tail reflects the fusion of green, blue and pink hues. They usually prefer to spend their quality time beneath the leaves of plants and only make flight during full sunlight. The unique thing about them is that they prefer to fly and search for food alone. But they also found in groups in clear days. Recognizing Apollo Butterfly is very easy due to its attractive white body with eyespots on the wings. Its forewings have various black eyespots and hindwings are beautifully decorated with striking four red eyespots. Apollo Butterfly is found in specific areas of Spain, France, and Italy. Along with beauty, they are also very famous for their brilliant defensive strategy. Glasswinged Butterfly marks its name at number 3 in the list of most unique and beautiful butterflies. They have elegant transparent wings and are found across Mexico and Colombia. 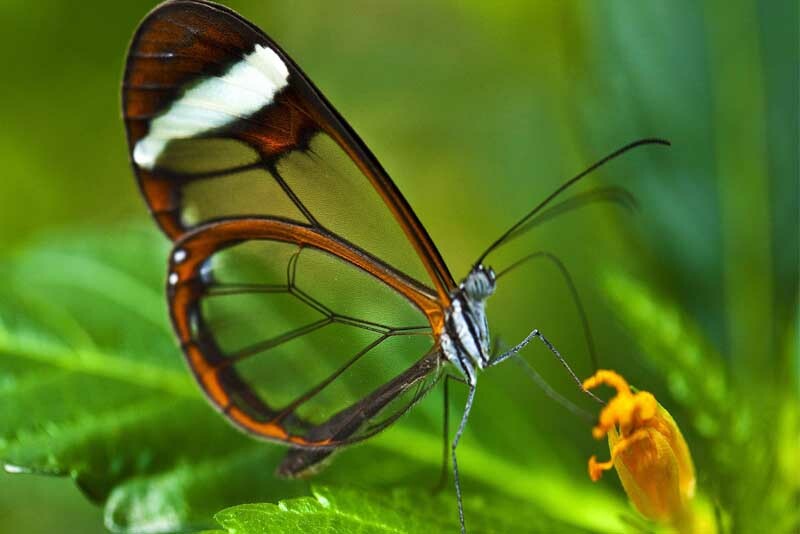 Their transparent wings help them against their potential predators. Birds and reptiles found it very difficult to catch them due to their transparent wings. They are the beautiful member of a large family of swallowtail butterflies. Emerald Swallowtail is mainly found in Southeast Asia. They contain wings of shining green bands. The underpart of its wings is black and orange. The dead leaf butterfly is a stunning example of amazing animal camouflage. The underpart of its wings is brown and dark in color. The irregular patterns and veins present on the wings make resemblance with a dead leaf. Unlike underpart, the upper part of its wings appears in a number of striking colors including blue, orange, white and brown. They are also popular with the name of Indian leaf butterfly, native to tropical forest across Asia. The resemblance of their elegant wings with dead leaf helps them to hide from their potential predators. They prefer to remain in a place where they usually rest and find food. They only move from the place when they found some threat. Subscribe to our Newsletter and never miss another depth World article.. Copyright © 2019 Depth World. All Rights Reserved.